The Tavistock Fall Fair (fondly and humourously referred to by some locals as the ‘TNE’) has been around for numerous generations. Fed by the loyal Tavistock and area community; it has evolved from a more modest beginning as shown below by a 1908 photo contributed by The Tavistock Gazette with permission of the Tavistock & District Historical Society. The first Friday, Saturday, and Sunday after Labour Day is very important to Tavistock as it marks the all important Tavistock Fall Fair. From a small beginning to the present three day event it entices many former residents to journey back to the old home town each year. This year marks the 160th anniversary of the beginnings of the Tavistock Fair. Back in the fall of 1852, about fifty members of the East Zorra Agricultural Society met for their first show. The agricultural society was made up of a group of farmers who got together to help each other with assuring quality livestock. They bought a stud horse for 175 pounds, 8 rams for 12 pounds, and a bull to share. In 1854 fees were paid for entries to the London Fair and one man was paid to walk a horse to London to participate in a show. 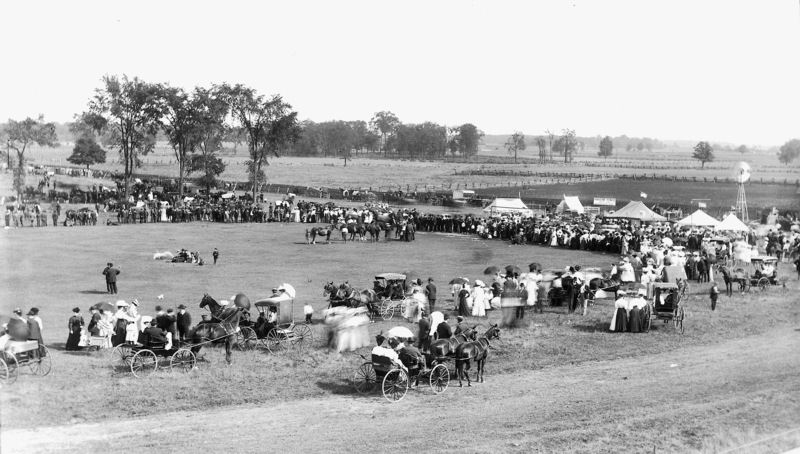 The first fall show was believed to have been held near Strathallan, just south of Hickson. Later the site used was the Adam Mohr farm, just south of Tavistock. According to information in a tattered, hand-written cash book, tucked away with 150 years of the society’s minutes and receipts, in the first year, 1852, the receipts were 47 pounds, 2 shillings and 6 pence. There was a Government grant of 21 pounds. The expenses were 40 pounds, 12 shillings and 8 pence. The farmers of the adjoining township of South Easthope formed a similar organization, the South Easthope Agricultural Society and they held their fair on the John Mogk farm, at the site of Oxford and William Streets, Tavistock, with entrance along Mogk Street. These two agricultural societies held union fairs together (except for 1873) until 1906, when the passage of the Agricultural Society Act forbade the holding of union Fairs. The two societies decided to unite and form the Tavistock Agricultural Society and hold the first fair in 1907, September 16 and 17. The new organization has continued to hold an annual fair each year, has continually improved, and has never reneged on its prize money. The Society had acquired 7 acres of land from Adam Mohr, later becoming Queen’s Park in Tavistock. In 1918 the land was deeded to the municipality with a stipulation that the Agricultural Society would have use of it for their fall show. In 1975 use of the land came into jeopardy when the municipal council agreed to sell a portion of land (where the 1923 arena stood) to the local milling company. The Society appealed to the Supreme Court of Ontario and won. Over the years there have been many improvements to the facilities, including perimeter fencing, landscaping of the old railway right-of-way, construction of a storage building (1977), a cattle barn (1980), and a portable stage. In a joint effort with the East Zorra-Tavistock Township, the Agricultural Society installed water and hydro connections throughout the Queen’s Park. A new arena was built by the township 22 years ago and a new pavilion is presently being constructed. The Agricultural Society has a responsibility to promote agriculture and rural purpose, while still offering the townsfolk an interesting show. With that is mind, the fall fair has had great success in extending the show from two days to four days over the years. Ten years ago, the midway offered Loonie/Toonie Night on the Thursday (set-up) evening. This was a suggestion from Townsend Amusements, who have a long-time association with the Fair, and it has proven to be a very popular event which continues every year since. There’s no lack of events for area residents to attend during the weekend of the Fair, including the ‘Garlic Festival’ in Stratford, so it is always a challenge to plan events that will attract people to the Fair. Attendance for our Fair was down a bit this year from previous years because of rain on the Friday night and Saturday morning. This resulted in cancellation of the popular Heavy Horse Show and the Hunter and Jumper Shows. For many years competitors come from great distances to attend the Heavy Horse class featuring Clydesdales, Percherons, Belgians, and Haflingers, with hitches from unicorn up to tandem. There’s always lots of challenge and excitement with the hunters and jumpers too. Every year since 1993 a theme is selected and promoted during the Fair. The 1993 theme was ‘Milk’. Initially there was a separate class for the theme exhibits, but now every Class has the goal to include theme items in their prizelist. The Arena and attached Curling Club facility are filled to capacity with all the indoor exhibits and vendors. The exhibits are moved in Thursday evening and Friday morning and, after a complimentary hot meal for all the volunteers in the Memorial Hall, judging of the exhibits starts at 1:00 p.m. In 4 hours the judging is completed and the displays are up – a beautiful sight to behold! It’s always amazing to view the quality of exhibits that include flowers, vegetables and fruits, culinary arts, handicrafts, woodworking, quilts, Home Brewed, Maple Syrup and Sugar, photography and fine arts, Junior and school children’s exhibits. The newest exhibit class is scrapbooking (2009), and it is becoming very popular. A section for the three town Nursing Homes is set up every year for over 40 years. It is open to Nursing Home residents only and the Activity Directors of each home decide together on the items to include in the prizelist each year. Everything from poems, stories, crafts, quilts and garden produce are included in the list, based on the Fair Theme for the year. The Nursing Home residents look forward to seeing their items on display at the Fair and, those who are able, are brought to the Fair late Friday afternoon to browse the exhibits and have their supper meal at the Grace United Church booth in the Arena. ‘Community Organizations’ is another class that has existed for years. It began as ‘Ladies Organizations’ and featured displays from the many Women’s Institutes in the area. However, in recent years a number of the Institutes have disbanded (only 3 competed this year), so the name of the class was changed in 2004 to include other groups, like the Opti-Mrs. Items for this class are selected by the convenor and committee of the class, including anything from quilts, plants, photography, baking, scrapbooking, and crafts. The ‘Holidays’ class began in 1993 under the name ‘3 Steps to Christmas’. In 1996 it was changed to ‘Happy Holidays’ and included other seasonal items for Easter and Thanksgiving. Now this class also includes St. Valentine’s Day, Hallowe’en, Canada Day, Summer Holidays, and Spring Break. ‘Antiques’ is a class that was new in 2002. Items included in the prizelist have to be no higher than 18 inches, as the locked glass case limits the height. The list of items changes every year and ideas come from a visit by the committee to the local Antiques Warehouse. Appraisal for items brought in was offered for a couple years, but was not in huge demand, so is not offered now. Other competitions occurring during the Fair include a Pet Show (since 1982), 4-H Achievement Day and Club exhibits, cattle show, sheep show, swine show, and Residential/Rural/Business Theme display competition. A Field Crop competition is run every year with judging of the local farmers hay, silage corn, soybeans, coloured edible beans and grain corn. A banquet is arranged in February to honour the winners and present the awards, sponsored by Syngenta Canada Inc.
A number of activities to entertain the visitors have been included over the years, such as a Fashion Show, Arm Wrestling, Egg Drop competition, Firefighters competition, Tug-of-War, soap box derby, parade, beer tent and dances. A very popular event, which began in 1986, is the Airband Competition. This is a lip-synching contest where many local ‘entertainers’ can show off their talents on stage. There is a Junior Class (11 years of age and under), Intermediate Class (ages 12-19), and Senior Class (18 and over). Cash prizes are given out after a panel of judges has made their choices. This is an outdoor event and always well-attended. In 1992 there were 22 acts and in recent years the number of acts has decreased, although always a fun event. The first Fair Queen Pageant also started in 1986 and many young women have competed. A few years ago the name was changed to Fair Ambassador and there has been one male contestant so far. In 1990 Queen, Lynne Nicholas, was crowned Miss CNE, Elizabeth Bender (1990) was chosen CNE Miss Congeniality, Sarah Mae Yeates (1997) was among the seven finalists and Becky Riehl (1998) was first runner-up to Miss CNE. The Baby Show had its debut in 1980 and over the years has filled the Memorial Hall to capacity on Sunday afternoon at 1:00 p.m. Babies are not judged on being the best, but rather on “fun” categories, such as longest middle finger, curliest hair, biggest fist, and bluest eyes. All prizes for the winners of the categories are hand-knit or crocheted sweaters made by friends of the Society. All babies receive a bag of goodies donated by local businesses and the Society. There is also a long table of door prizes for the babies and audience members. Twins and triplets receive special gifts for their attendance. Another great event on Sunday is the Antique and Classic Vehicle Show, running since 1993. There have been as many as 200 vehicles on display (1998) and coming from as far as Seaforth, Kitchener, Burgessville, St. Marys and Stratford. Everyone enjoys seeing the vintage vehicles, motorcycles, and antique tractors, and there are some prizes and draws to be won. The lawn tractor races on Sunday afternoon provide excitement for young and old and have returned as a popular event for the past few years. In 2009 the Fair theme was ‘Beans’ and the Saturday afternoon entertainment committee decided to hold a “Chili Cook-off” to promote the theme. Area groups and businesses entered with 10 liters of chili and samplers were sold to the fair-goers. Judges judged the chili on various categories (meatiest, most beans, hottest, vegetarian) and ballots were submitted by the public for their favourite (People’s Choice). The event was so popular, that it has been held every year since. The Saturday Afternoon Committee also held a “Farm Toy Show and Sale” in 2003, when ‘Tractors’ was that year’s fair theme. A collector tractor was available for sale, and completely sold out. From that event, the ‘Silent Auction’ was born and now this is an annual event, held in the Arena, and raises over $4000.00 each year for the Fair. Local businesses, groups, and friends of the Fair contribute lots of items to make this such a success. Over the years, the Tavistock Agricultural Society has done fundraising through special events such as the Yuk Yuk’s Dinner Theatre, chicken barbeques, video dance parties, and dances. More recently a Hypnotist/Dinner evening was held, as well as a Mystery Dinner Theatre. Money raised has been put back into the community through projects sponsored and supported by the Society. From 1990 to 1996 the Society gave more than $27,000 to the new Tavistock arena, which serves as the exhibit hall. It is the present goal to pay all bills and come out in the black each year and now is more difficult to accumulate surplus monies to assist with community projects.